Star Wars: Battlefront will receive free and paid DLC updates in 2016 adding new maps based on Bespin, the Death Star and more. Star Wars: Battlefront is a fun game. Fun as it is however, there are few who would deny that it's not without its problems. The biggest of these is, easily, its lack of content. Launched with only a handful of maps and worthwhile play modes, there are many who look at it as a significant step down from previous entries in the series. That being the case, Electronic Arts and DICE, in an announcement released today, have detailed their plans to flesh out the current game and satisfy those fans looking for a little more. Blast, Droid Run, Drop Zone, Hero Hunt and Heroes vs Villains support for the Tatooine Survival map (now called the "Raider Camp"). 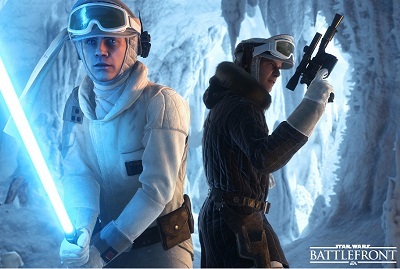 New Hoth outfits for Luke Skywalker and Han Solo. New Daily Challenges and immunity events aimed at "giving players the chance to earn credits and unlocks" faster than normal. Balance "tweaks" to "both weapons and multiplayer modes. The game will receive more free updates in February, including a new multiplayer map for Hoth that will be compatible with game's Walker Assault, Supremacy, Fighter Squadron and Turning Point modes. The February update will also add a new Hoth Survival mission and expand the Turning Point mode to all maps that can support Supremacy and Walker Assault. In March, the game will also add another new Tatooine Survival level along with another new Endor map that will support its major modes. In addition to the free content, EA also unveiled its plans for paid DLC in the months ahead. In 2016, Battlefront fans will be able to purchase expansion packs adding maps based in Jabba the Hutt's palace (March 2016), Bespin and Cloud City (Summer 2016) and the Death Star (Fall 2016). A fourth package is also in the works for "early 2017." In other words, if you enjoy Battlefront the next few months will be adding a lot to love. Just speaking personally, I think the expansion of the Turning Point mode will be a big boost to the game's value. The only other thing I really want is a more substantial fighter combat mode. Who knows, maybe we'll see that in the 2017 DLC.